As you may know by now, we love being surprised by unexpected delights during our food travels. Beautiful Yellowstone Country Montana is full of many such unexpected delights. 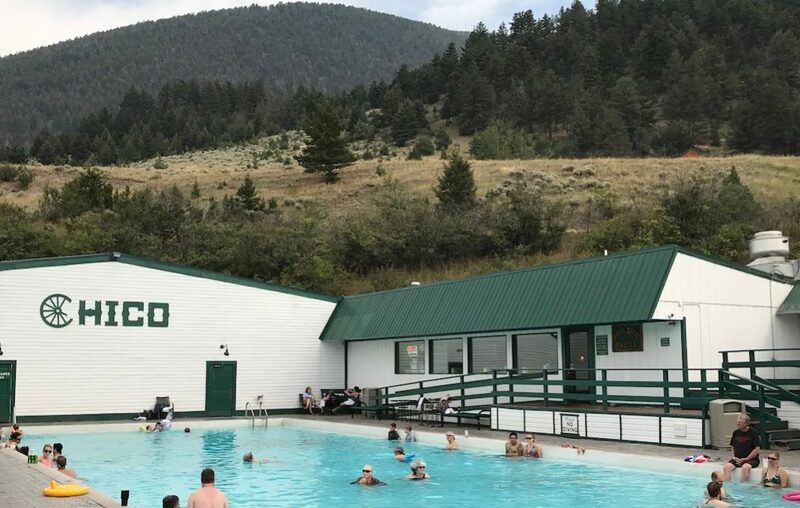 And one of the most delightful places we explored was Chico Hot Springs Resort & Day Spa in the most decidedly surprising little town of Pray, Montana. We’d like to thank and acknowledge our hosts at Chico Hot Springs Resort & Day Spa, who provided us with complimentary food and accommodations. This article reflects our own opinions based on our experience. While we’d argue that just about everywhere in Montana feels like a majestic getaway, Chico is a beautifully composed, top-of-the-line version. 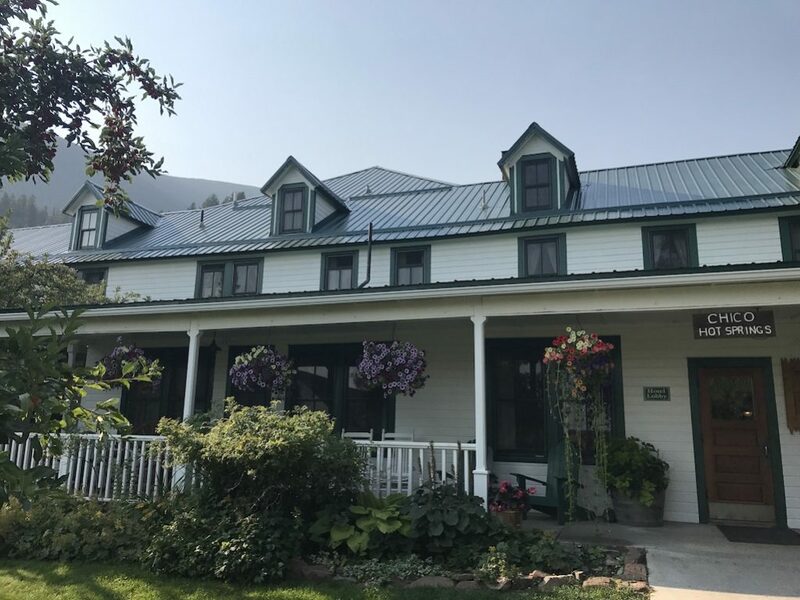 The foothills of the Absaroka Mountain Range provide a stunning backdrop for the gorgeous manicured grounds of this rustic and romantic getaway. It somehow manages to exude luxury and casual comfort in a single breath. Perhaps that’s because there are many different ways to experience Chico Hot Springs. First is a visit to its namesake natural hot spring pools. The hot springs flow into two pools. One is more than 100 degrees and connected to a slightly cooler pool. You can linger a little or a lot in the warm mineral waters. If you want to just hang out and watch others, you can do that too. Or get a bite and a drink at the Poolside Grille. When we were there, happy guests of all ages waded in and out of the water. There was much chatting, mingling, relaxing and enjoying the whole scene. Chico Hot Springs relaxing pools. And that’s just the beginning of the scene. There’s also fun Saloon that feels like you’re literally stepping back into the wild, wild west. The decor and ambiance are appropriately lively, and there are plenty of forms of entertainment. You’ll find everything from foosball and shuffleboard, television, and video poker. They also offer live music on the weekends. The Saloon has plenty of room inside so that even when there’s a crowd, you won’t feel crowded. Over the years, Chico Hot Springs Resort has grown quite a lot. The main lodge is now accompanied by additional wings, lodges, cabins, log houses, chalets, cottages and more. There’s literally something to suit everyone. 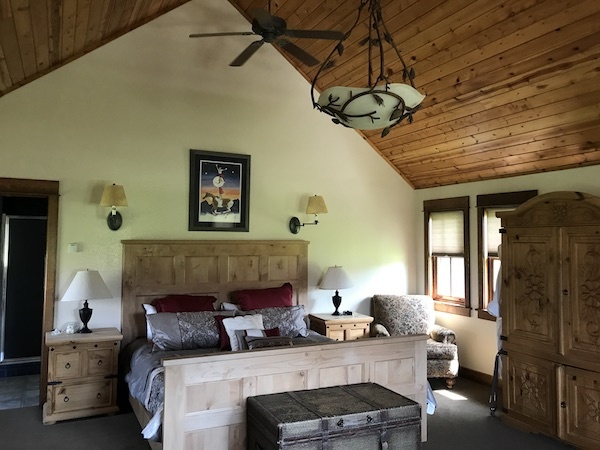 Accommodations range from a five bedroom Mountain View log house to the Chico Short Line, which is an actual train caboose that was moved to the property and turned into a luxury room. Our stay in one of the North 40 Cabins provided us a spacious cottage with the comforts of home. It offered a lovely view, peace and quiet and a hammock outside for lounging, one of our favorite occupations. 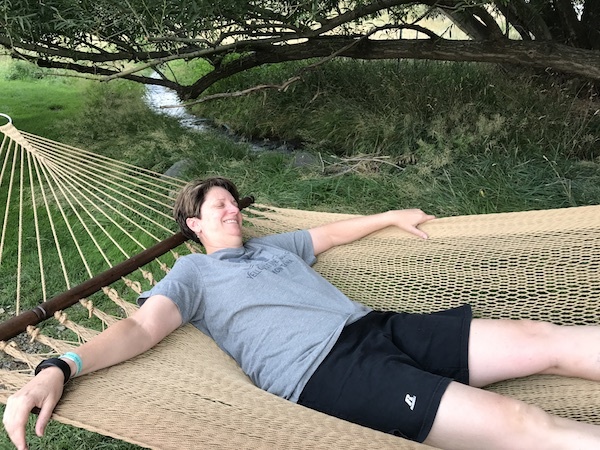 Relaxing in a comfy hammock with our own babbling brook outside our cabin at Chico Springs. One of the most decadent luxuries available at the Chico Hot Springs Resort & Day Spa is, well, the day spa. They offer spa and massage services such as hot river rock therapy, citrus salt scrubs, mud wraps, geothermal therapy, and more. There are also specials and combos of these relaxing, rejuvenating services that will melt away any stress you have and we know this with certainty because we experienced it first hand. It feels amazing to have a naturally relaxing professional massage really help you find your happy place. And, that we did all over Chico Hot Springs’ grounds. If you like to get out in nature, you can do that at Chico Hot Springs during any season. There are horses for riding and walking trails and gardens in the summer. 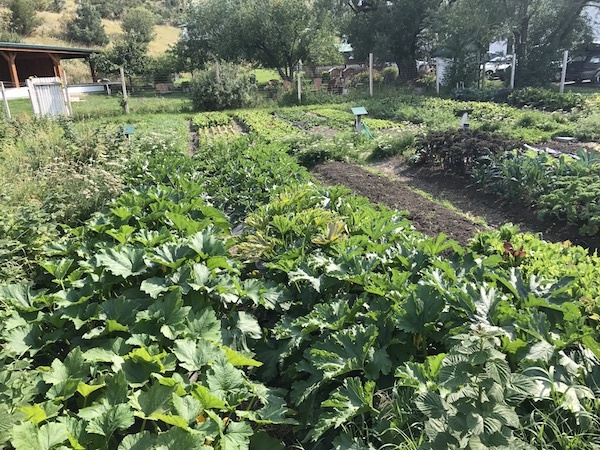 We were fortunate enough to meet one of the gardeners and enjoy a stroll through the bounty that helps provide their produce. 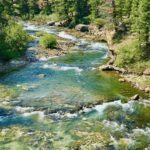 The folks at Chico Hot Springs will be happy to arrange all kinds of enjoyable pursuits for you, including river rafting if you’re up for it. There are cross-country skiing and snowshoe trips available in the winter. A special activity we’d like to come back for comes from Absaroka Dogsled Treks. You can join with a team of Siberian Huskies leading you and your well-trained Montana musher on the trek of a lifetime! The folks at Chico Hot Springs will be happy to arrange all kinds of enjoyable pursuits for you, including river rafting if you’re up for it. There are cross-country skiing and snowshoe trips available in the winter. A special activity we’d like to come back for comes from Absaroka Dogsled Treks. You can join with a team of Siberian Huskies leading you and your well-trained Montana musher on the trek of a lifetime! 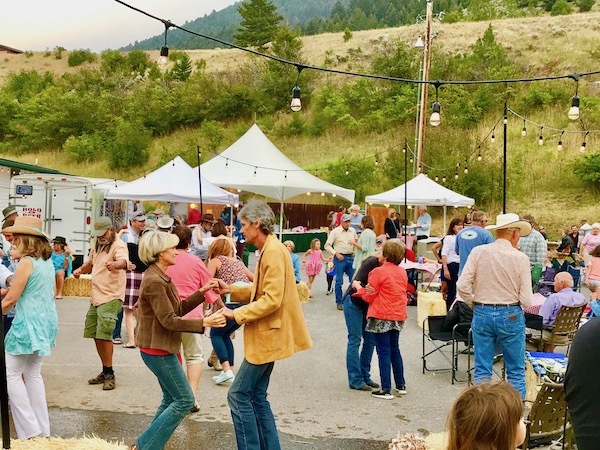 While we were there, Chico Hot Springs provided the venue for the annual neighborhood block party where the whole vicinity filed in to share laughs and food and music and fun. There were more than a few happy smiles from folks who may or may not have been old friends. They all certainly treated each other as though they were. We loved seeing families all together enjoying the festivities. 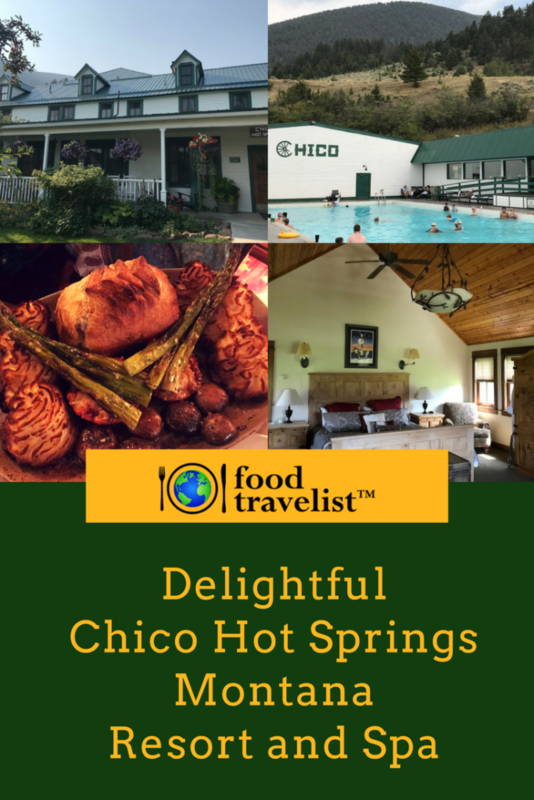 Of course, we wouldn’t be Food Travelist if we didn’t talk about the food and beverage scene at Chico Hot Springs. In this case, we have to say we’ve saved the best for last. The Dining Room at Chico Hot Springs offers one of the best experiences you will have anywhere. It’s fine dining in a cozy and comfortable atmosphere. The food ranges from outstanding classic favorites to adventurous favorites. 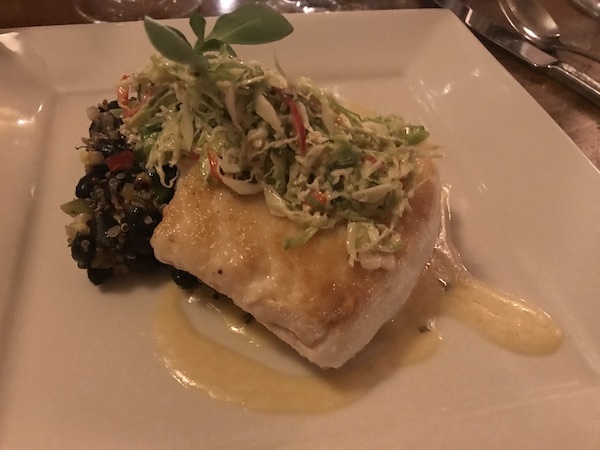 We tried the unbelievably delicious Beef Wellington for two and the Wild Alaskan Halibut with smoked corn, black beans, quinoa, Epazote Cream Sauce and brussel sproat slaw. There are wonderful fish dishes and vegetarian too. 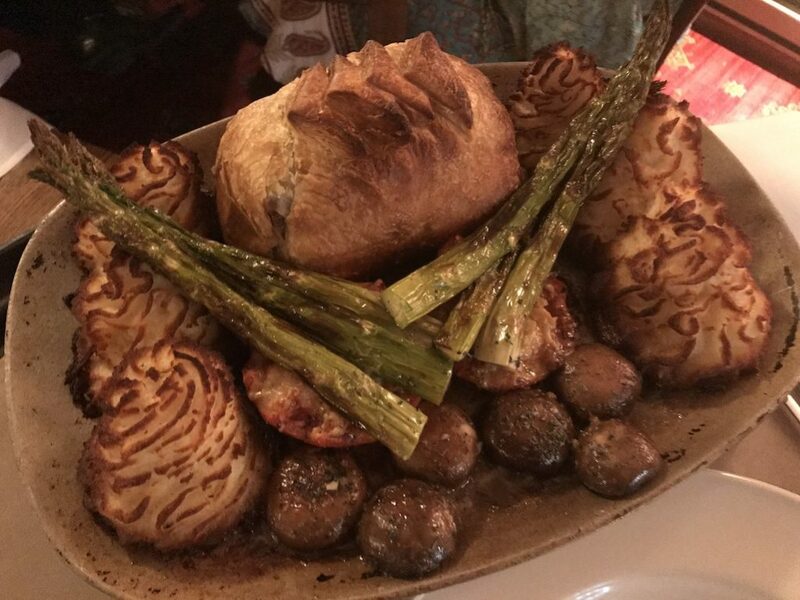 They adjust the menu seasonally to take advantage of the freshest ingredients. Desserts are given attention too. 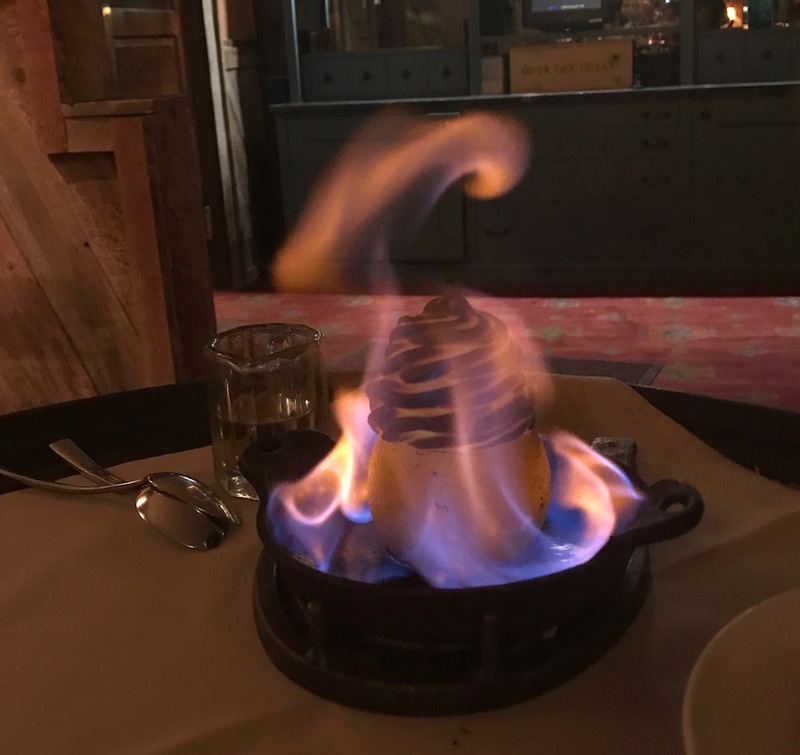 A most popular choice is a hollowed out chocolate-lined orange filled with meringue, sprinkled with rum and served flambé. It just doesn’t get any better than this. Service is personable and attentive and they are very accommodating, making sure that every guest feels cared for and appreciated. We were fortunate enough to share our meal with Chico Hot Springs owner and wine expert Colin Kurth Davis and his lovely wife Seabring. 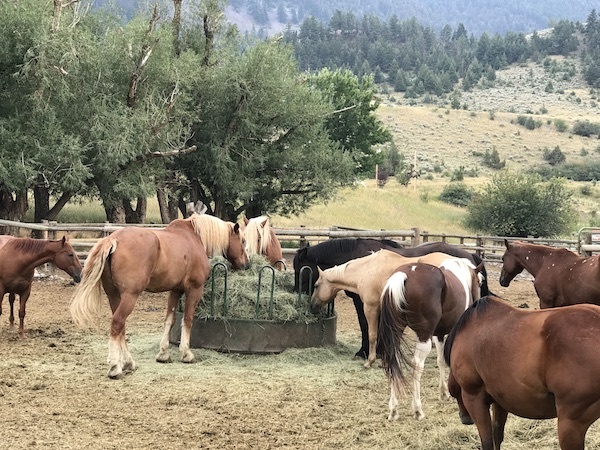 Having created a successful cookbook and history of Chico Springs, A Montana Table, Seabring is currently working on her next Chico-inspired work. 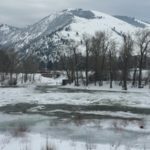 The two share a passion for Montana and Chico that shows through in everything they say and do and they offered stories about the history of the hot springs dating back to the first recorded date of 1865. They also shared the details of development and changes that brought the resort to its current expansive state. And even that will be enhanced by the addition of acreage for more trails across the road. 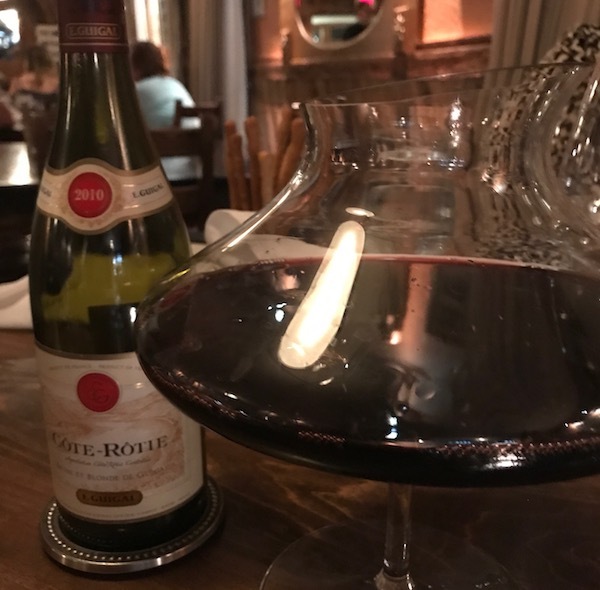 We have to say that as much as we like wine, we never dreamed that we’d see a restaurant wine list that was as encyclopedic as the one Colin has put together for Chico’s dining room. Indeed, it’s really a wonder to behold. And, if you’re a wine-lover too, you’ll be happy to know that the Wine Cellar is available to book for a private meal for 12 to 16 guests. A lovely hidden spot for a private celebration of any sort. It’s no wonder that the laid back and elegant atmosphere of Chico Hot Springs appeals not only to visitors from afar but also the locals. In fact, many nearby celebrity ranch owners such as Dennis Quaid, John Mayer, Tom Brokaw, Michael Keaton, Jeff Bridges, Meg Ryan, Peter Fonda appreciate the chic but low-key lifestyle afforded by the area. And they sometimes make their way to Chico Hot Springs, even jamming along with the live music from time to time. Many delicious courses, glasses of wine and hilarious stories after our meal, we really couldn’t imagine a better way to spend the evening. 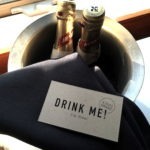 It was a real treat for us to experience an excellent meal in a beautiful place with wonderful service. One of our magnificent memories of Yellowstone Country Montana. There was only one logical way to finish off our visit to Chico Hot Springs. That is with an amazing breakfast buffet that included everything you could possibly want. Eggs, pancakes or waffles, fresh fruit and more. Not to mention local bacon that was out of this world (yes, we admit it, we went back for seconds!). House-made granola and caramel bread pudding put us over the top. 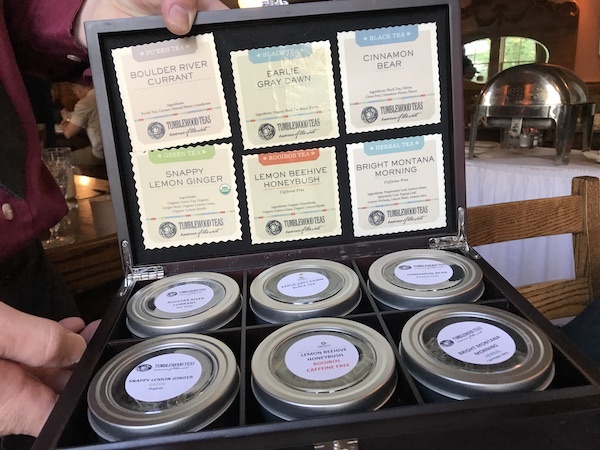 The extra special bonus prize was the Tumblewood Teas served at Chico Hot Springs. Tumblewood Teas is a company in nearby Big Timber, Montana. We had a chance to learn more about them during a visit to their offices, but that’s a story for another day. Needless to say, we loved their teas and started our morning with Bright Morning Montana. The loose leaf tea of peppermint leaf, lemon grass, spearmint leaf, papaya leaf, lemon verbena, lemon bloom and lemon juice was the perfect way to start the day. There’s something special about Montana’s Yellowstone Country. The accommodations complement the area’s majesty in a way that truly enhances your appreciation of all it has to offer. If you’ve got some time to explore and enjoy this amazing part of the country, you will have a trip to remember forever. And, if you want to enjoy an enchanting resort with deep historical roots, amazing cuisine, caring service and every amenity imaginable, don’t miss out on a chance to visit Chico Hot Springs & Day Spa. You will emerge refreshed, renewed and exceedingly content. We’ll have to put Chico Hot Springs on the list as the place to stay the next time we want to visit Yellowstone! Sounds warm, inviting and enticing! Ahhhhhh. You will love it Kim. Relaxing, beautiful and wonderful food. Your adventure really seems like a “break” from the routine! I’ve always wanted to soak in a hot spring, I think it would really help my chronic back pain. And the pampering would be another great reason to go. I’ll have to put this on my bucket list. Oh my lanta there are Hot springs? This sounds so fantastic. I think it would be an amazing place to travel to! Wow this looks like an amazing place to visit!I haven’t been to Montana before but I would love to visit this place. I have always wanted to visit Montana for many reasons. Now I think I’ll add this resort and spa to that list of reasons. Wow, the hot springs sound amazing! Looks like a wonderful place for a visit! I know I’d enjoy spending some time there! Wow what a beautiful looking place to stay, I am loving the look of the pools. and that food is just WOW! I would take any chance to visit the Chico Hot Springs in Montana! The food looks great, the people seem to have a great time, and the ambiance is so cozy and welcoming. That hammock sure looks like a relaxing place to spend a lazy afternoon! 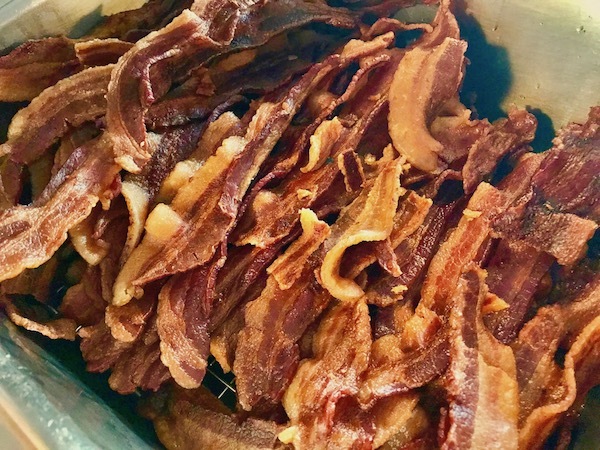 Well the picture of the bacon had me if nothing else. 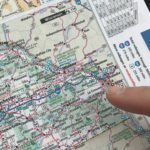 I have never been to Montana or that area, but so want to visit. We have it on a road trip list, maybe next year. This place looks great. This is what I picture when I think of Montana! Beautiful landscapes, horses, and comforts of home. My husband will be sold by the bacon alone. It looks like the Chico Hot Springs needs to be on my travel bucket list! This was indeed a relaxing and rejuvenating getaway. A true indulgence for the senses. The hot springs is something I would look forward to. I’ve always wanted to see Montana. It sounds like this resort and spa was a relaxing place to stay and the food sounds good too. This resort sounds like a lot of fun. I could definitely use a nice getaway with plenty of good food. 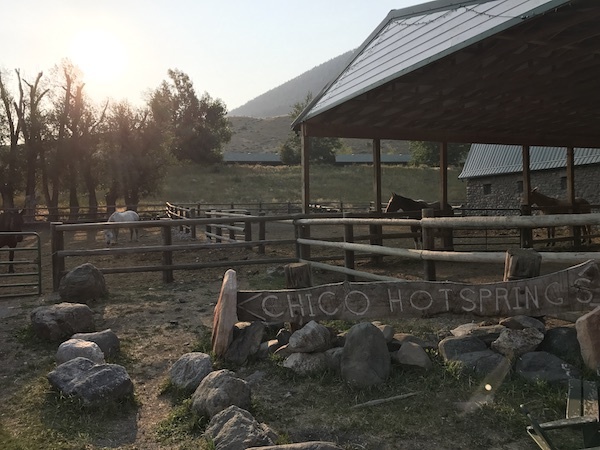 It sounds like you had an awesome time at Chico Hot Springs Resort and Spa. 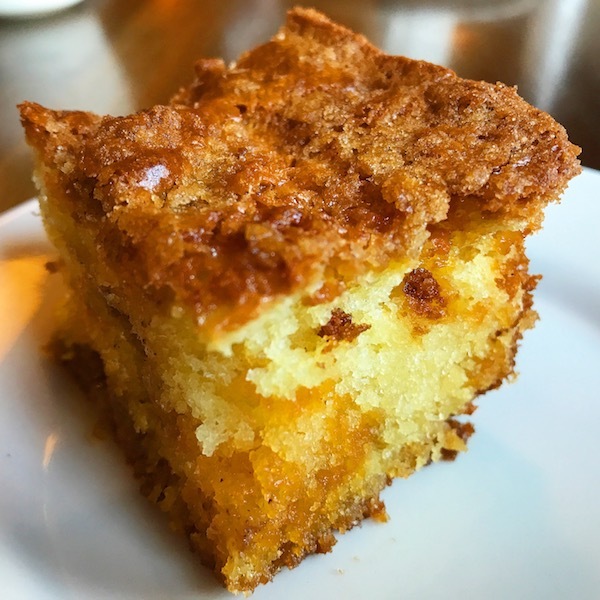 That coffee cake looks delicious. What a neat place to visit. Sounds like you had a great time, between accomodations, relaxing, and things to do. I would love to check out the hot springs! Looks and sounds like the perfect weekend get away with the hot springs. Tons of fun stuff and activities and the food looks down home and great tasting. Chico Hot Springs Resort & Day Spa looks like my kind of place. I would love to check it out the next time I am in the area. This looks like an amazing place to visit! Montana is such a gorgeous state. I would love to relax here. Looks like you had a wonderful time visiting Chico Hot Springs. I’ve never heard of it but I imagine the scenery is inviting and judging from your post there are tons of things to do. Looks like a great place to relax, enjoy and indulge. I would love to check this place out. This is right up my alley. I would love to be for a wonderful blissful weekends. It looks beautiful there. This looks like such a relaxing place to visit. I could do with some hot springs treatment right about now. Achy bones from cooler weather! You don’t know how badly I want to go to a spa for some time alone! I think I’d even enjoy just some quality time in one their log houses just with a book. Chico Hot Springs is at the top of my bucket list! I needed a vacation right now and honestly, it felt like I went on a vacation after going through your pictures. I’m gonna look into going to this place next month. Need that much-needed pampering. This is totally my type of getaway!! I want to go now so bad! I LOVE the rooms and that light fixture in the bedroom, I almost bought the same one for our bedroom until we decided to make our own! I still love it! 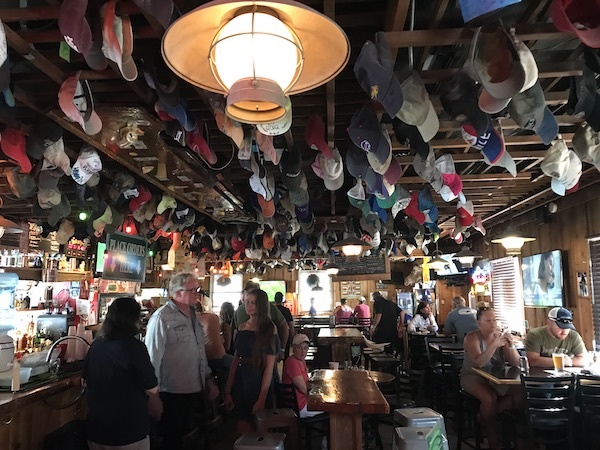 I thought the hats hanging from the ceiling of the saloon was funny. I have been to a place that hung ties from the ceiling once. They would cut it off if a man wore one inside haha. You would love Chico! I love the story about the ties in the saloon. Priceless! Wow! There’s lots to do in this one huge location. It’s a great vacation spot for a large family or a group of friends. I’m eyeing on this for a teambuilding venue too with colleagues in the office. Breakfast also looks promising. Yum! Chico Hot Springs sounds like my kind of place. I would love to try their homemade coffee cakes and flaming desserts. Looks like there is so much to see and do! Thanks for sharing this! Oh this looks great. We are looking to book a nice weekend trip away with no kids. 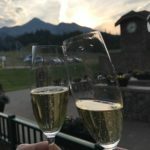 I am going to share this post with my husband Montana is not too far for us so it might work perfectly! Thank you for the great review. This place looks wonderful! Hot springs? Sign me up! I’ve never been to Montana but I want to go to Yellowstone someday. This looks like the perfect place to stay.